Management valuations is a tool available to any subscriptions where production trackers are present. It's how you apply monthly valuations to your livestock on hand, and have those values flow through to your profit & loss report and your balance sheet. They're great for getting that extra level of detail about your livestock that may otherwise not be captured until the end of the financial year. Management valuations can be found under the Adviser tab. Before you get started, you'll want to make sure you've mapped a livestock on hand account (balance sheet) as well as a valuation movement account (non-cash, profit & loss). It's also recommended that you enable the setting include in reports, this will allow you to do budget and forecasted management valuations. 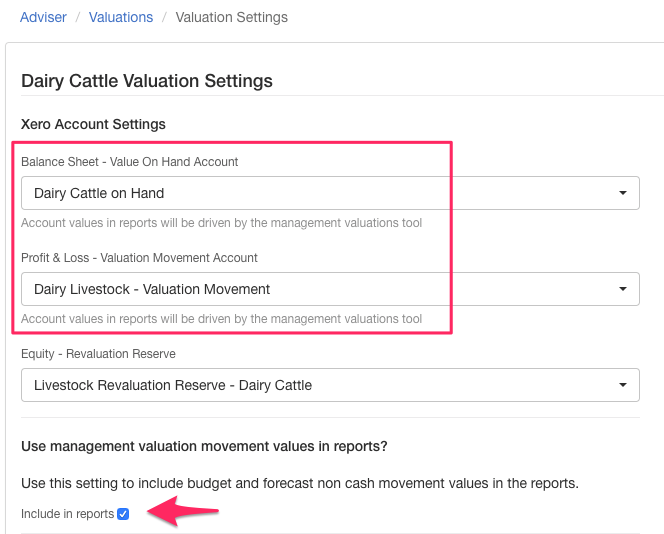 After you've setup your livestock tracker to use management valuations, you'll want to head inside the tool itself. You can set the monthly values to be whatever you wish - whether you're using last years tax defined values, a variation of those, or something you've set internally, you can accurately see the on hand value of your livestock and have that represented as an asset across both Figured and Xero. Each month as your livestock on hand changes (or even when it doesn't), Figured will push these values to your P&L report into a unique valuation movement line which sits under your livestock tracker. The numbers shown are able to be clicked into to further break down why that value is being shown.